Why should you invest in silver? This is such a great question and if you have been paying attention to the global economy recently, you may have frequently asked yourself why should you invest in silver! My wife and I are extremely entrepreneurial. We have always tried to be open minded about business, making money and investment opportunities. We have spent many years improving our own personal development and mindset by reading books or listening to audio books from educators like Jim Rohn, Robert Kiyosaki, Michael Maloney, Zig Ziglar, Eric Worre, just to name a few! We have also spent time studying the global economy, the history of the global economy and global fiat currencies. It’s an obvious point when you think about it, but if you want to be successful in life, you need to study successful people and do what they do! Success leaves clues….. You may have noticed that the most successful people or companies in the world do not tend to save their paper money in a savings account or bank where it might earn a measly 1-2% interest. You will find that successful people tend to diversify to protect and further grow their wealth. How do they do this? Simple. Successful, wealthy people and successful companies tend to invest a lot of their paper money into precious metals and other commodities. One of the most popular precious metals to invest in is silver. Is a surprise that Robert Kiyosaki owns a silver mine? No it isn’t! He knows that silver is one of the greatest investments in the world and has been teaching this philosophy for many years. Did you know that HSBC and Barclays Banks have been acquiring large amounts of precious metals?! Is there a good reason why they are doing that? Of course there is!! Silver is massively undervalued (at the time of writing only $20 per ounce). Anyone can invest. Silver is an industrial commodity – it is used in electronics and a wide variety of industries. Silver is now more rare than gold! Yes – there is now LESS silver on planet earth than gold! Silver is one of the best ways to protect yourself from the effects of inflation. Silver unlike paper money has intrinsic value. Silver is easy to collect in different forms and weights – bullion coins, bullion bars, numismatic coins etc. Silver is money in its purest form. As Michael Maloney teaches us – it is important to understand that wealth is never destroyed – it is merely transferred. On the opposite side of a global financial crisis, there is always an opportunity! Many top financial educators and trainers like Robert Kiyosaki and Michael Maloney believe that if you truly want to take part in the greatest wealth transfer that the world has ever seen, then you need to start collecting and or investing in solid silver by exchanging some of your paper money for it. Why Should You Invest In Silver – What About Gold?! I thought you would ask that! There is absolutely nothing wrong with gold. Gold, like silver is also an important precious metal and has always essentially been the investment commodity of choice. However, there are a few key reasons why silver is potentially a better investment than gold. Gold is typically hoarded. It is not consumed in various industries like silver is. In other words, there is the same amount of gold on earth today as there was last week. You cannot say the same for silver! There is less silver on earth today than there was last week, because silver is gradually being used up within different industries. Silver is currently at such a bargain price point that practically anyone can invest in silver if they wanted to. The price of gold is prohibitive to many investors. Hopefully by now you are not still wondering why should you invest in silver?! Hopefully we have explained the benefits of why should you invest in silver and why it makes so much financial common sense. If you have enjoyed this post and got some value from it – please like, comment and share. 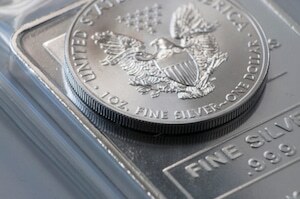 As we have discussed, collecting or investing in silver just makes perfect sense. However, being able to collect this precious metal for FREE is an incredibly exciting proposition! If you would like to know how you can personally collect silver for free each month, simply take the Silver Tour here. We would love to have the opportunity to work with you and help you collect silver for free and also earn an extra income at the same time. We are passionate about helping people improve their financial heath with silver, and we look forward to the opportunity of connecting with you soon. Now that you have read this post about why should you invest in silver, we hope you will see that it makes so much sense to start to acquire some silver each month – especially for FREE.